The last ten days or so I’ve spent at CERN testing new designs of pixel detectors for the ATLAS experiment. Since it was the IOP’s #iamaphysicist event on the same day we were setting up, I tweeted out the following picture. To measure our pixel detectors, we need a beam of particles from a particle accelerator. Fortunately at CERN, we have many to chose from! Just see the diagram of all of the accelerators required to get the protons to the LHC. Our experiment uses the SPS, or Super Proton Synchrotron, the last accelerator in the chain of accelerators which feed the LHC with protons. The protons enter the SPS at 25 GeV and are accelerated up to 450 GeV (note the LHC accelerates to 7500 GeV, or 7.5 TeV, per beam). We then use a target to change the type of particle from a proton to a pion. The LHC is the last ring (dark grey line) in a complex chain of particle accelerators. The smaller machines are used in a chain to help boost the particles to their final energies and provide beams to a whole set of smaller experiments, which also aim to uncover the mysteries of the Universe. I have a new flatmate now who has a keen interest in science. The other day when I came home he asked (in French) “What did you do today?”. It’s a simple question. Although it doesn’t always have a short answer as I also knew that he also wanted to understand, what do I do on a day-to-day basis as a scientist? This question is the inspiration of today’s post, which is a diary of my day. Last night I was invited to the wine and cheese social event at a workshop taking place at my lab, which was a great chance to see a friend and former Manchester colleague who was attending the workshop, and also to meet new people in ATLAS who were outside of my analysis group (ATLAS is ~4000 people, so it’s not unusual that I haven’t met them all!). The conversation developed into some very interesting debates and I ended up staying later than I had planned. Hence this morning’s early start was a difficult one. I have an hour’s commute to get into work so on the way I grabbed a pain au chocolate at the train station (as I didn’t have time to eat breakfast at home) and spent the time on the train proof-reading the thesis of a PhD student I work with. The first meeting of the day started at 8.30am. This was exceptional and was arranged to fit with the schedule of someone in Australia. For them the meeting was at 6.30pm, so it was just about reasonable for both sides. I am one of two contact people for a part of our analysis, which means I keep up-to-date with what everyone is doing and report back to the conveners of our analysis to make sure everything is on track. This is my first leadership position in ATLAS analysis and I learn a lot about how to do the job well every day. It’s useful to have these meetings to get advice and support from my superiors. This post is a quick one as I’m currently on holiday in New York. Today we went to visit the Rockefeller Centre and nearby is a statue that looks very familiar to me. The bronze statue is of a male figure, the Titan Atlas, holding up the sky. The reason it is so familiar to me is because my collaboration at CERN is called ATLAS and our logo is based on this statue (although it’s recently gone through re-design to make the figure more androgynous). Below you can see the previous version of our logo, and the newer design that we use now. The previous ATLAS logo (above) and the new one (below). Since I was there, I couldn’t resist have a photo taken with the statue. I like to add as many photos and images as possible* into my presentations and so I’m sure this will be useful. Here’s the photo! In the nearby LEGO shop, there is a LEGO version of this statue. We already have LEGO version of our detector, both in a large version (shown below with Prof. Higgs), and in smaller versions. If you would like to see the small version as part of a LHC LEGO set, you should head over to the LEGO IDEAS page where you can vote for it! Professor Higgs signing the ATLAS LEGO rebuilt at the University of Manchester. I should head off now, there’s a lot more sight-seeing to do! Last Wednesday, the Large Hadron Collider at CERN started colliding protons with stable beams at the highest energy we’ve ever achieved! I had a very early start (alarm went off at 5.30am) to be in the ATLAS Control Room and tell everyone all about it on social media through the ATLAS Twitter accounts. There was a team of us from ATLAS Outreach working that day. Even at 8am, it was standing room only as so many people wanted to see the first stable beam collisions at 13 TeV. CERN had a live webcast to explain what was happening and at one point, when checking it, I realised I was live in the background of an interview with ATLAS Spokesperson, Dave Charlton. So, I acted natural and was thankful that, even though I was supposed to be doing the social media, I wasn’t on Facebook. 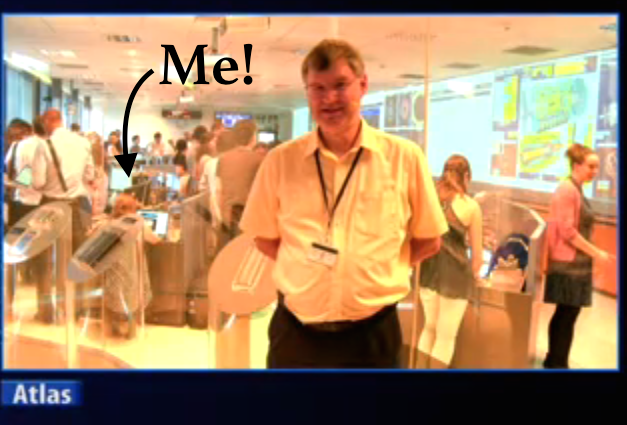 Me on the CERN webcast. I first started trying to learn French when I planned to moved to Geneva to work at CERN for my PhD. I took a few lessons and downloaded a podcast, but when I actually arrived, and was surrounded by Brits, or English speaking colleagues, I quickly found that other tasks took higher priority and I didn’t get any further than ordering food at a restaurant. However, when I accepted a post-doc in Paris, I knew things would be different. Officially the work was in English since I would still be working with the same international researchers at CERN that I was before. But this time I was moving out on my own, so I wasn’t going to have a large British group of friends, and I had been warned that many of the engineers and support staff that I would be working with either didn’t speak English, or strongly preferred speaking French. Not to mention all of the daily life tasks I would have to face, such as finding an apartment. This was OK. In fact, it was one of the reasons looked outside of the UK for my first post-doc; I was tired of being the only monolingual in a crowd of bi-, tri- and even poly-linguals! I had to learn at least one language and moving somewhere I was going to be forced to speak it was the only way it was going to happen. How do you spend your rest and relaxation time? In physics, as in running, how you manage your rest time is just as important as how you spend your time working (or training). I am currently preparing for a long-distance race in April, so even though I have a to-do list that extends onto multiple pages, this gives me the motivation to take time away from my computer and get outside. Yesterday I went for a run along the La Seine, up to the famous Notre Dame cathedral and down to Luxembourg gardens. It was a beautiful sunny day, but the temperature was around freezing. Below are a few photographs I stopped to take along the way. How do you spend your time off? Let me know in the comments below!